In the series Energies Pablo Contrisciani’s paintings are the representation of different kind of moods altogether inside of one frame. They have an intense and sensual sense of unity. The shapes had color that was partly knocked down, but mostly electric, and they were improvised and spontaneous but at the same time precise. The paintings play between these two elements: shape and color. Sometimes they merge, and sometimes there is a tension between them. This play in tension between pictorial surfaces and applied materials creates complex and straightforward layers of expressive abstractions. These series of paintings unifies oppositions and energizes a blend of rational and emotional notions. They juxtapose humble elements with big gestures and make references to pop culture, to spiritual narratives and to some historical concepts. About the Artist Pablo Contrisciani is an Argentinean artist residing in Miami from 1998. He earned his Master in Painting at the National University of Fine Arts of La Plata, Buenos Aires, Argentina. He has recently participated in exhibitions at Karpio-Facchini Gallery, Miami; Morgan Lehman Gallery, New York; Light Contemporary, London; Mackey Gallery, Houston; Solar Art Gallery, East Hampton and ArtCenter/South Florida, Miami. 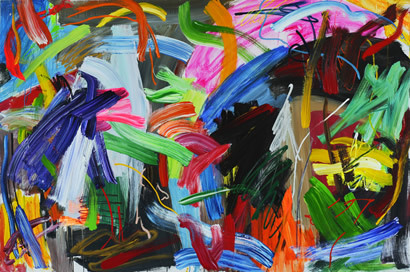 He has exhibited also in the Art Fairs: scope London; scope New York and scope Miami; Art Toronto; Fiac Paris; and arteamericas. His work has been reviewed in publications such as Art in America; Art Nexus; Arte al Día; the New Times, the Miami Herald and El Nuevo Herald. Public and corporate collectors from USA, Latin America and Europe hold Pablo Contrisciani’s works. On View until December 19th by appt.